Personally, my real retro film camera is 35mm, with images being wider than tall. But, the choice of most ‘social’ photo sharing services use square images. This makes the management of photos by the service much easier, they don’t have to worry about the presentation of wide vs tall images. Unless you have a ‘square’ frame of mind when taking a picture with your iPhone, or specifically using one of the social apps to take the picture, you will be cropping every image to fit the format. This can mean the loss of some of the photo message. 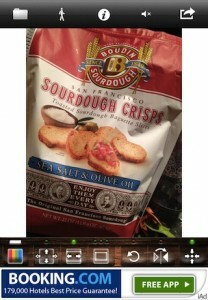 A free app, Squaready, takes the opposite approach to the square problem than cropping. It gives you a square area to work in. Placing your image in that work area, you can expand to the edges, then fill in the area around the image with a color (tons available through picker). Squaready also offers a few tuning options; rotate, mirror, and manual resizing. When you have the image as you like, you can directly post to Instagram, save to the iPhone photo library or ‘sent to’ another app. A variety of image size and formats are available too. The app is free, but has iAds taking up the lower edge part of the screen. There isn’t an in-app purchase option to remove the ads, but the developer claims that if you tap the iAd you won’t be bothered with it for a few hours.